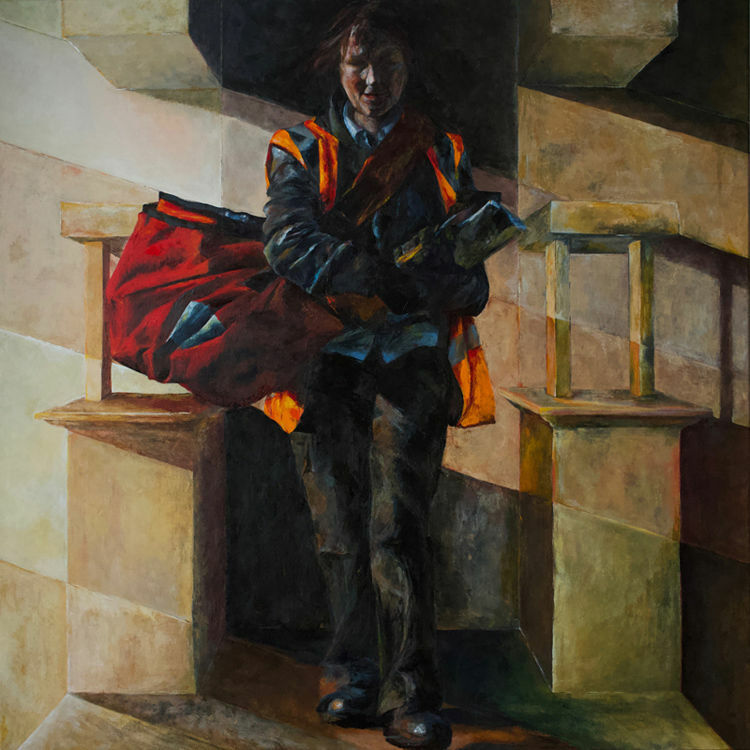 I painted Sue my postie as I was intrigued by the fact that everyday she delivers letters to people almost unnoticed. Getting to know her a little better, I walked with her on the rounds and found her role beguiling. She was out early in all weathers, shouldering a heavy bag of letters and offering smiles to the numerous people of the community. I wanted to elevate her status in society, like the heroic sibyls of the Sistine Chapel. Capturing the strength of her small frame, stoic in her bandolier styled uniform - a very familiar figure in red and orange. The strong spring light falls across the painting exposing her to the elements, imbuing a sense of time as the Bath stone weathers in the shadows. Our town, built with Bath stone lent a sense of something epic as she checks her step on the uneven pavements.